Algoma Tankers Limited (ATL), an operating unit of Algoma Central Corporation (Algoma) (TSX: ALC), a leading provider of marine transportation services, Thursday announced the purchase of a 2010-built product tanker that will become the eighth ship in Algoma’s Great Lakes-based product tanker fleet. The 16,512 dwt vessel will be re-named the Algoterra as part of its transition to ATL ownership. “We expect to take ownership of the Algoterra in mid-March in Europe and she will join our fleet in early April. The ship will be the youngest tanker we operate and as our newest ship, she will be the workhorse of the ATL fleet for many years to come,” said Gregg Ruhl, President and CEO of Algoma. The acquisition of a second tanker vessel in just over three months demonstrates Algoma’s willingness to invest to meet the growing needs of our customers for marine-based transportation of petroleum products. Acquiring high-quality assets is critical to our commitment to operate in a safe and efficient manner. We saw this as the ideal time to take advantage of the availability of attractive international assets in this segment, leverage our robust existing infrastructure for technical and commercial management, and capitalize on our position as the employer of choice for Canadian seafarers across the provinces. “With a long-term contract in place with a strong counterparty, we expect this acquisition to be accretive to earnings upon the ship’s arrival in Canada,” said Peter Winkley, Algoma’s Chief Financial Officer. 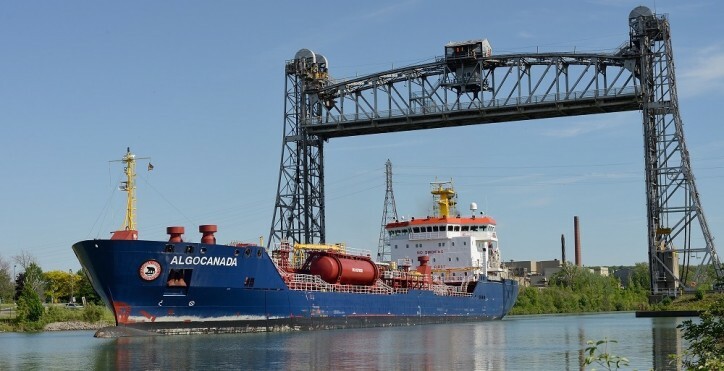 Algoma continues to invest in fleet renewal for its domestic fleet. The Company also recently announced the delivery of the Algoma Conveyor, a 740’ self-unloading dry-bulk carrier that is currently en route from China and which will join the 18 vessels of Algoma’s dry-bulk fleet early in the 2019 navigation season.